I had no expectations for my first visit to Sri Lanka. With little research and two long flights, I landed and was straight on a train to Tea Country. Struggling to stand in the overcrowded second class carriage (I forgot to book a seat in first) with a ridiculous amount of unnecessary luggage, it was an hour of slow, bumpy, stop-start riding before I jumped in to an empty seat. The journey went on for 5 hours - 45 minutes over schedule. Irritated and sweaty, the train eventually took a turn and revealed Sri Lanka's lush, green, Tea Country. Breathtaking, even through itchy red eyes. The Tea Trails transport was waiting at the station with water and a new SUV for the short trip to our bungalow, in this case Tientsin. Built in 1888 at an altitude of 4600 ft, Tientsin was named after a village in China where the original tea seedlings came from (all thoroughly explained on your included tea tour). Three other bungalows, all unique in their own heritage, are dotted about the hills with a fifth soon to be opened. On arrival you are introduced to your butler, clad in a smart checked sarong. Tea education starts immediately with a welcome tea mocktail - refreshing and needed. The high colonial house, shared with only a few other guests, was British and surrounded by English gardens. Deep corridors with high ceilings lead to a grand dining room, lounge and guest suites. 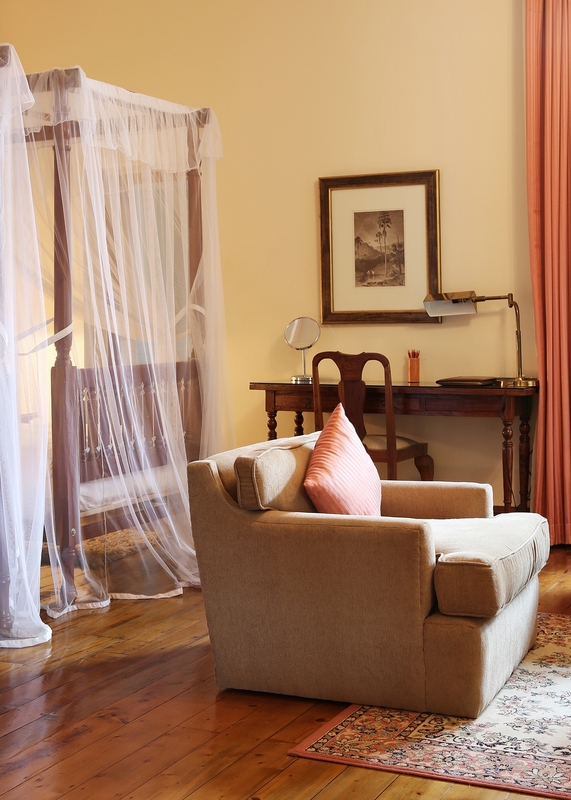 Each suite is furnished with four poster beds and polished floorboards, retaining the historic design while being up to date. International electrical outlets are provided, utterly convenient, and laundry service is same day and complimentary. Turn down service comes with a hot wattle bottle too. Tientsin was really starting to turn on it's charm. Bathrooms are decked head to toe in stunning decor. Rustic tiles, white on white tubs and sinks, with a dash of chrome, had me pouring bath after bath. In house products are refreshing and plentiful. Leaving at 8:45am each day is a tea experience tour to the local plantation Norwood. Guided by the resident tea expert, he takes you through the process from picking "two leaves and one bud" to the fair trade factory where you witness the leaves being dehydrated, bruised and turned in to Black Ceylon Tea. It left me with a new found appreciation for the industry and tasting of tea. If you visit, make this tour mandatory. Food at Tea Trails is tailor-made and a journey in itself. There are no menus, instead the chef comes to your suite and talks you through what is available. I left it in his hands and wasn't disappointed. Breakfast is served at a time of your choice, with tea of course. Fresh pastries, local jams and butter come out with a fruit plate of mountain passion fruit, sour banana and pineapple. Choosing from a traditional Sri Lankan breakfast or the more familiar porridge and eggs was difficult, but both styles were executed well. Lunch is waiting on your return from the morning activities and it is cleansing and nourishing. Three courses with a fresh vegetable soup, white fish and local dessert leaves you satisfied but not stuffed. Tea makes a major appearance at afternoon cream tea. Perfectly pickled cucumber sandwiches with chocolate eclairs and short buttery scones kill those munchies while you relax on the terrace overlooking the tea plantation. The tea menu ranges from light, dark and green, poured at the precise moment for maximum enjoyment. I was craving steak that night and they went above and beyond to satisfy me. The following evening I opted for a Sri Lankan curry dinner. It was a visual explosion of 8 different curries ranging from beetroot, okra, potato, chicken and the best dhal I've ever had served with crunchy papadams glistening with melted butter. Afternoons are passed walking the grounds, refreshing yourself in the pool or relaxing in the lounge. For the more adventurous there is mountain biking, hiking trails between tea bungalows or white water rafting excursions. Tientsin also has a tennis court and croquet on site. Pre-dinner drinks in front of the roaring lounge fire go longer than anticipated, mingling with the other guests. The butlers are spot on with their cocktails and mixing that you forget dinner is waiting. Relaxing on the verandah, sipping tea and reading my thoughts away, I felt tranquil up in the highlands. Surrounded by historic luxury, I could still hear the faint beeps of tuk-tuk horns and school children singing to remind me I was in Sri Lanka. My stay at the peaceful Tea Trails didn't leave me itching for the bright lights of the city. While airs and graces aren't even remotely suggested, I almost wanted to play the part. Dressing up for dinner I felt I had been transported back to the colonial era and this is what tea trails really gives you. A glimpse in to history. The authentic planter feel with subtle, efficient service makes you lose yourself in Sri Lanka's tea country. Pure bliss. RATES: Starting from US$600 per room per night on an all-inclusive basis including meals, afternoon cream tea, alcoholic drinks, a daily activity and laundry service. IN-ROOM: Bath tub, mosquito netting, reading material, wardrobe, international electrical outlets, heated towel rack, fans, two writing desks, lounge seating. I stayed courtesy of Tea Trails and The Resplendent Ceylon Group.